If this is an emergency, please do not follow these steps. Go to your nearest Emergency Room, call VUPD at (615)-421-1911, or 911 off-campus. If you have an urgent crisis, you can visit Crisis Care Counseling at the University Counseling Center during the hours of 12:00 p.m – 4:00 p.m. or call the UCC After-Hours line at (615) 322-2571. 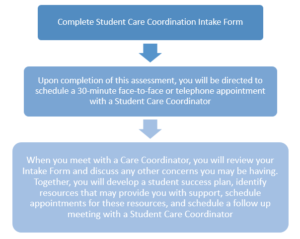 You can reach out to the Student Care Coordinator you worked with previously by phone or email. You may also call 615-343-WELL to schedule a follow-up appointment.